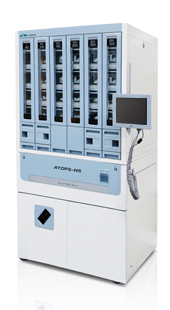 The NS20 model is suitable for large pharmacies and hospital pharmacies and comes with the latest automatic sensor and communication technology ACRS-III and ATDPS, a conventional automatic medicine classification and packaging system. ACRS-Ⅲ is a technology that automatically recognizes the position of a canister containing a drug. The platform automatically stops packaging if it detects the wrong medication during preparation. Users can also easily detach and attach the entire lower main frame and quickly solve a problem when an error occurs. Also, the machine can select the size of the dispenser bag according to the size and quantity of medicines thereby reducing the consumable packaging. Packing speed has also improved dramatically by improving the route of the drug for dispensing, the company said. “The new product ‘NS20’ is a state-of-the-art auto dispenser with significantly improved productivity, space efficiency, and cleaning management, and we will continue to invest in R&D for applying the latest technology,” JVM Vice President Kim Sun-kyung said.